Former Haryana minister Subhash Batra and other senior leaders who have been expelled from the Haryana Janhit Congress and those who have resigned in protest against the move have convened a meeting in Rohtak on June 14 to decide their future course of action. A group of residents of Bolni village in Rewari district are livid over the alleged police failure to nab certain persons of the village who cheated a farmer of his four acres worth Rs 1 crore on the pretext of getting him a loan for purchase of a vehicle. The Haryana Government has promoted 19 IPS officers with immediate effect. Swaranjit Singh, V. B. Singh, Rakesh Malik, Alok Joshi, V.N Rai and P.V. Rathee have been promoted to the rank of Director-General of Police in the grade of Rs 75,500-80,000 whereas Shriniwas Vashisht, Anil Dawra, Parminder Rai, Yashpal Singal and Mohinder Lal have been promoted to the rank of Additional Director-General of Police in the pay band of Rs 37,400-67,000 plus grade pay of Rs 12, 000. Agitated relatives of Pankaj, who had committed suicide two days ago, continued their protest for the second day today. AK Raghav, Special Judge, Narnaul, has sentenced Jagdish Parshad, manager, Central Cooperative Bank, Mahendragarh branch, Nizampur, to two years’ rigorous imprisonment with a fine of Rs 2,000 under Section 7 of the Prevention of Corruption Act and three years’ rigorous imprisonment with a fine of Rs 3,000 under Section 13 of the Act. In default of payment of the fine, the convict will have to undergo rigorous imprisonment for six more months. Three persons died of electrocution in two different incidents in the district today, while one labourer was buried alive when the walls of the well in which he was working caved in. Ravinder of Mahendipur and Braham Singh of Murthal village have been sentenced to life imprisonment by Additional and District Sessions Judge Subhash Mehla holding both of them guilty of the murder of Dharmender of Murthal village on November 1, 2007. The court also imposed a fine of Rs 3,000 each on them. Laying stress on reservation for women in the allotment of the party ticket by political outfits for parliamentary as well as state Assembly elections, INLD supremo and former Haryana Chief Minister Om Prakash Chautala today categorically favoured the Women’s Reservation Bill saying that the INLD would support the Bill if the party ticket for elections instead of seats in Parliament and state Assemblies were reserved. Students living in Sardar Patel Bhawan Hostel of Chaudhary Devi Lal University here were surprised to find a new “guest” in their mess during lunch today. Under fire from various quarters within his party, Kuldip Bishnoi seems to have received some support from the party rank and file in Panipat. Two air-conditioned buses of the Haryana Roadways that started from the Sirsa depot for Chandigarh and Delhi yesterday could not complete their first journey as both the buses developed snag midway. Haryana Chief Minister Bhupinder Singh Hooda announced a comprehensive welfare scheme for building and other construction workers and their families and inaugurated a worker facilitation centre in Dhana village under the IMT, Manesar, in the district to mark World Day against Child Labour today. Addressing the gathering, Hooda announced that such centres would be opened in those areas of the state where construction activities were more. Four such centres would be set up in Gurgaon alone, he added. According to the welfare scheme, construction workers would have better access to social security, healthcare, skill upgradation and occupational safety. Apart from providing these facilities, the worker facilitation centres, named Labournet Centres, would also help workers get better jobs and wages. These centres would be equipped with facilities for workers’ registration, health check-up, health and accidental insurance, training facilities for safety and skills, schooling, crèche, provisional store and counselling centres. Various business organisations and trade unions gave their resolutions to the Chief Minister, affirming that they would not engage child labourers in their establishments. Later in the day, the Chief Minister presided over a sensitisation seminar on the issue of child labour jointly organised by the Haryana Institute of Public Administration and the state Labour Department on the occasion of World Day Against Child Labour in the HIPA Complex in Gurgaon. In his address, Hooda asserted that Haryana was the first state in the country in which all districts had been covered under the Rashtriya Swasthya Bima Yojna, adding that the scheme was now being extended to construction workers as well. Listing the schemes being implemented by the state government for the welfare of labourers and other weaker sections, Hooda said Rs 1.30 crore had been spent on the opening of residential rehabilitation centres for destitute and migrant children in Yamunanagar, Panipat and Faridabad. The government would consider opening more such centres if needed, he added. “We have also opened special schools under the National Child Labour Project in Gurgaon, Faridabad and Panipat districts and are going to establish more such schools in other areas of the state,” he maintained. Exhorting the participants to identify key strategies that would be suitable for Haryana, the Chief Minister assured them that the state government would take the necessary steps in the interest of children, especially girls. Hooda said special enforcement drives had been undertaken by the Labour Department under the leadership of deputy commissioners to withdraw children from prohibited work and prosecute the defaulting employers. He also released a souvenir, “Child Labour: Challenges and Concerns Today”. The chairperson of the National Commission for Protection of Child Rights, Dr Shantha Sinha, ILO Director for the Sub-Regional Office for South Asia Leyla Tegno Reddy, member of the Planning Commission Feroja Mehrotra, Haryana Chief Secretary Dharmvir, Labour and Employment Minister A.C.Chaudhary and Parliamentary Secretary Rao Dan Singh also addressed the participants, while Labour Commissioner Surina Rajan proposed the vote of thanks. Batra and another former Haryana minister Krishan Murti Hooda hail from Rohtak district and have been expelled from the party by the leadership on disciplinary grounds. Batra confirmed the proposed June 14 meeting. The meeting will, among other things, finalise the date and place for holding a general house of workers of the HJC to discuss the decision of party president Kuldip Bishnoi to expel leaders from the organisation without following “democratic norms”. He reiterated that the leadership had dissolved all units of the party before the parliamentary elections. As per the norms, even Bishnoi was at present not the de jure president and had no authority to expel leaders. The decision could have been taken only by former Chief Minister Bhajan Lal, patron of the party. He alleged that Bishnoi was trying to run the party on “corporate lines”. According to him, he and Krishna Murti Hooda were the convener and the co-convener, respectively, of the party. In the present situation when the party units had been dissolved, they were the seniormost functional leaders in the organisation’s hierarchy after Bhajan Lal and hence had taken a decision to expel Bishnoi from the organisation for “anti-party” activities. The proposed general house of the workers will consider and ratify the party’s decision to expel Bisnoi. Former general secretary Ramraj Sharma, who was also a member of the disciplinary committee of the HJC and who resigned yesterday in protest, hinted that the general house of the workers could be convened on July 12. Panipat, Jind, Mewat and Rohtak were being considered as the venue for it. The persons who allegedly cheated the farmer, Ram Dhan, included a few property dealers. 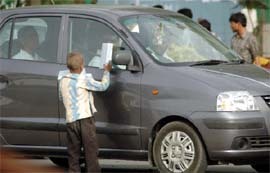 These persons reportedly told Ram Dhan that he would have to mortgage his land to get a loan for purchasing a vehicle. In an FIR lodged with the Model Town police station, Rewari, Ram Dhan requested a property dealer, who was also his friend, to arrange a loan for him. The dealer introduced him to some persons, who, he said could help him. In the last week of April, the accused took Ram Dhan to Rewari on the pretext of preparing papers for the loan. There he was served liquor. While in a state of intoxication, he was made to sign several papers. On May 14, Ram Dhan was again taken to Rewari ostensibly to complete the formalities regarding mortgaging his land to a bank as security for the loan. According to the FIR, Ram Dhan came to know on May 19 that instead of mortgage deed, he was made to sign a sale deed on May 14 in favour of Naresh Devi, wife of Charan Singh. When he contacted the accused, he was reportedly told that his property would be returned to him if he paid Rs 8 lakh to them. The FIR was lodged against Charan Singh, his wife Naresh Devi, Sajjan and Shiv Ratan. Charan Singh applied for anticipatory bail before the court of Additional Sessions Judge, Rewari, SK Sharma, who turned down the plea that the investigations were at the crucial stage and there were specific allegations against the accused. The residents of Bolni village led by Prof NS Yadav, a social worker, alleged that instead of arresting the accused, the police was giving them time to get anticipatory bail from the court. They say since the court has turned down the plea for anticipatory bail, the police must act fast to ensure justice to an innocent farmer. A delegation representing several villages met local MP and former union minister Rao Inderjit Singh as well as MP from Rohtak Deepender Hooda in this regard in Delhi. The MPs assured them that justice would be done with the farmer. The delegation also handed over a memorandum to KK Khandelwal, additional principal secretary to Chief Minister. Khandelwal assured the delegation that the memorandum would be passed on to the Chief Minister. The apprehensions of the villagers regarding the police being soft on the accused came true when an application for anticipatory bail filed by Charan Singh came up for hearing before the Punjab and Haryana High Court here on June 10. Though the petitioner had contended that the matter was urgent and therefore the vacation judge should hear it immediately, the court did not agree with his contention and posted the case to be heard next month. Muhammad Akil, Dr R. C. Mishra, Manjit Singh Ahlawat and Shiv Shakti Rao have been promoted to the rank of Inspector-General of Police in the pay band of Rs 37,400-67,000 plus grade pay of Rs 10, 000. Alok Kumar Mittal, Arshinder Singh Chawla, Rajpal Singh and Partap Singh Ranga have been promoted to the rank of Deputy Inspector-General of Police in the pay band of Rs 37,400-67,000 plus grade pay of Rs 8,900. They blocked the state highway in Naraingarh demanding the arrest of MLA Ram Kishan and two others against whom the police had registered a case under Section 306 (abetment to suicide) of the IPC yesterday. Deputy Commissioner Samir Pal Saro and SP Y Puran Kumar tried to resolve the matter. The administration persuaded the agitators, but the relatives of the deceased said they would lift the blockade only after the arrest of the MLA. Later, the administration assured them that a probe would be conducted and action would be taken within two days. They lifted the blockade on the assurance of the administration and agreed to cremate the body of Pankaj. Meanwhile, senior leader of the BSP Maan Singh Manhera and other leaders of the party reached there in support of the agitators. Sources said a maternal uncle of the deceased was a senior functionary in the state BSP. According to Vigilance Bureau sources, Jagdish Parshad was caught by the bureau while taking a bribe of Rs 1,500 from Ashok Kumar, a resident of Pachnota village. Meanwhile, AK Bimal, Special Judge, Rewari, has sentenced Ran Singh, Patwari of Nahad in Rewari district, to rigorous imprisonment for two and a half years with a fine of Rs 5,000 under Section 7 of Prevention of Corruption Act. In default of payment of the fine, the convict will have to undergo rigorous imprisonment for three more months. Ran Singh was caught while taking a bribe of Rs 2,500 from Umed Singh, a resident of Karoli. Lakshman (45) and Ramesh (35), who had taken agriculture land on contract near Madh village in this district, were trying to repair the motor of their tubewell. As they were taking out the metal pipes from the bore of the tubewell, the pipes touched the high-tension wires going over their fields. They received a strong electric shock and were killed on the spot. Ramesh, an employee of the power nigam, received an electric shock and was seriously injured when he climbed a pole for some repairs at Tohana town yesterday. He succumbed to his injuries today. The police has booked two engineers of a private firm, engaged by the power utilities, as their negligence is alleged to have resulted in this accident. Prem Singh and Sultan Singh, two labourers were buried under the debris, when the walls of a well they were working in, gave way in Lahrian village today. They were taken out by the villagers with great difficulty but by then Prem Singh had died. Sultan Singh has been admitted to the community health centre, Bhuna, in a serious condition. On a complaint of Dharmender’s father, Inder Singh, a case of murder was registered against Ravinder, Braham Singh and Joginder. It was alleged in the complaint that on the night of November 1, the accused came on a motorcycle and Ravinder asked his son to come out of the house and shot him. “If it becomes mandatory for parties to award one-third of the party ticket to women candidates in the elections, the deadlock over the issue will be cleared easily,” he maintained. Addressing mediapersons at the INLD office here today, Chautala said some political parties were opposed to the Women’s Reservation Bill in its present form while others differ on the percentage of seat reservation. Referring to the debacles of the party in the recently concluded parliamentary elections, the INLD supremo said the party organisation would be reformed and office-bearers, who had been inactive for a long time, would be replaced. Active and energetic workers would be elevated to organisational posts. Exhorting party workers, Chautala asked them not to be demoralised by the party’s defeat in the Lok Sabha elections and get ready for the state Assembly elections as it could be declared any time. He announced that alliance candidates for all 90 seats would be declared on the birth anniversary of former Deputy Prime Minister Chaudhary Devi Lal on September 25 in consultation with the alliance partner. It was after a while that they could make out that the “guest” enjoying “rajmah-chawal” with them was the newly elected Member of Parliament from Sirsa Ashok Tanwar, who was on surprise visits of government establishments to know the problems faced by people. Later, Tanwar mixed up with students and asked them about their problems. Later, Tanwar went “unnoticed” to the local general hospital to know the problems there. Tanwar went straight to the general ward of the hospital and talked to patients admitted there. He also went to the trauma centre. Later, the Civil Surgeon, Dr Narinder Chaudhary, also reached there and apprised Tanwar of the shortcomings faced by the health authorities. He informed the MP that the trauma centre had become useless for the people as no neurosurgeon or neurologist had so far been appointed by the government. Talking to mediapersons, Tanwar said he was trying to get first-hand knowledge of people’s problems and would try his best to improve the conditions. Tanwar said he had met the authorities in the UGC for providing better grants to the CDLU and hoped that this would improve the academic standards of the university. Senior party leaders of the district and a former minister today came out in the open and backed the decision taken by the party chief stating that the expelled leaders were engaging in anti-party activities and “right action” had been taken against them. Speaking to mediapersons, former minister and senior HJC leader BS Kadyan and another party leader DN Tyagi said the decision had strengthened the party. Contrary to the claims of other party leaders that the two expelled leaders were trying to promote democratic practices within the party, these leaders said the activities of the two were demoralising party workers. The leaders claimed that a large number of party workers had full faith in the leadership of Bishnoi. The party was gearing up for the Assembly poll under his guidance and the results of the poll would silence the critics once and for all, they claimed. While the bus bound for Delhi developed a snag near Rohtak, the other one faced a problem near Ismailabad. The buses have been sent to a workshop in Ambala for repairs. The local depot of the Haryana Roadways had started two air-conditioned buses yesterday with much fanfare. Describing the snag as minor, RS Punia, traffic manager of the local depot, said the buses would start running from tomorrow.